I'm all caught up on these July and August blocks and ready to work on the last block of this sew along with Kristy of Quiet Play. The utensils block was amazingly pretty easy and quick. I may redo the pitcher and cups block. It sure is a process figuring out which fabric combinations work sometimes. It's been good to learn and practice paper piecing and I like it but sometimes don't because it seems I have to pick out and redo quite a bit. But it is amazing how you can get an interesting picture with all the angles and make a pretty block! 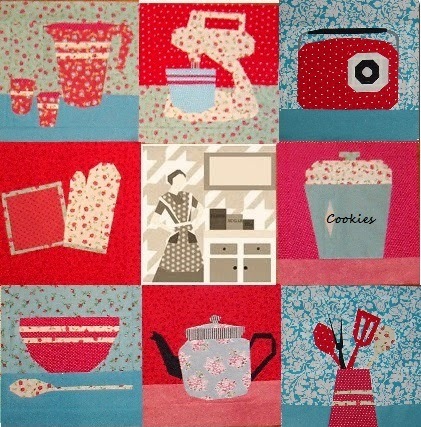 Check out Kristy's paper pieced blocks-- they're not very expensive and there's even a lot of cute free ones too. This combo is really lovely. These look great! I just finished my September block and I am so sad that the QAL is over! I love these! The colour combination really suits the style of the blocks.